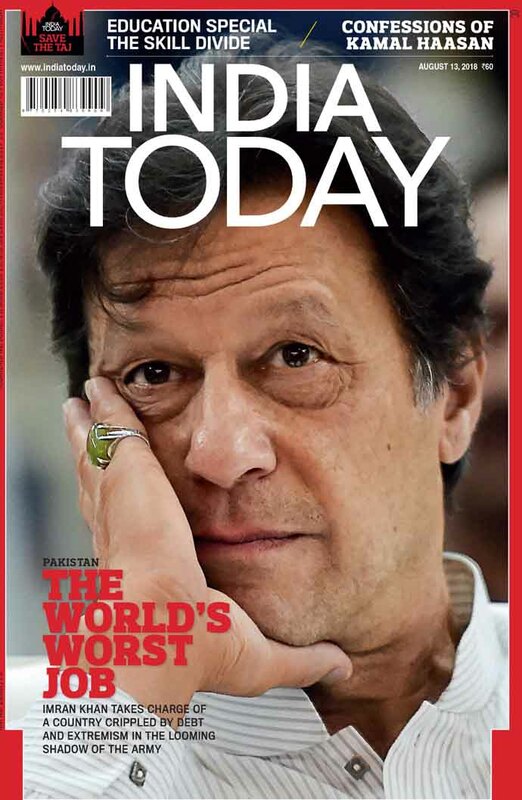 India Today cover story examines the challenges that lie ahead for Pakistan's new prime minister. Prime Minister Imran Khan. This is something Pakistan, India and, indeed the world, will need to wrap their heads around. As someone who’s watched Khan over the years, from his days as the charismatic cricket captain of Pakistan, I least expected the glamour boy to transition to PM of his country, though I did find him sincere, dogged and passionate in all that he did. Be it winning the Cricket World Cup in 1992, to setting up a chain of cancer hospitals named after his mother or taking the political plunge in 1996. In his first election in 1997, his party did not win a single seat. To his credit, he did not give up. His tenacity has to be admired. He can be consistent, too. At the India Today conclave in New Delhi in 2003, seven years after launching the Pakistan Tehreek-e-Insaf, he spoke of standing up to vested interests and the “small corrupt elite that keeps siphoning off all the resources. The rich get richer and the poor poorer”. A tenor not very different from his victory speech a day after the July 25 general elections where his party emerged as the single largest formation. Khan is well-intentioned, cares about his country and is in politics to make a difference. Now for the hard part. He steps into the driver’s seat of a nuclear weapon-armed country riven by sectarian strife, whose notable exports are the jihadists its terror factories pump into India and Afghanistan even as Pak­istan’s economy teeters on the brink of bankruptcy. The Pakistani rupee is in free fall and the foreign exchange reserves perilously low. India Today cover story, The World's Worst Job, for August 13, 2018. Among Khan’s first tasks will be to go, hat in hand, to the International Monetary Fund for a loan of up to $12 billion. An IMF loan will come with strict conditions that will strictly curtail the public spending key to his promise of ‘Naya Pakistan’. The country’s relations with its major benefactor, the US, are at a nadir; he has also been a severe critic of America through most of his political career. Besides, Khan has no administrative experience since he has never held elected office. It seems a lot like a newbie cricketer going out to face the ferocious West Indies pace bowlers of the ’70s with no protective gear. He also has to deal with the overweening influence of the Pakistan army that has ruled the country for 33 of its 71 years of existence. He must also counter criticism that he is a marionette of the military. I think such accusations grossly underestimate this charismatic leader who can be bold, audacious and headstrong. This is where I think he will, sooner or later, become a problem for the army. There is a belief that as long as the army does not change its foreign policy perspective, nothing will change in Pakistan. The army wants India as a permanent enemy and to be a dominant force in Afghanistan. Our cover story this week, put together by Wajahat S Khan, our contributing writer from Pakistan, examines Khan’s challenges. Group Editorial Director (Publishing) Raj Chengappa looks at what India can expect from Khan. Relations between India and Pakistan are wildly unpredictable and swing from extremes of friendship to war and near-war. I met Prime Minister Nawaz Sharif shortly before he swept to power on a landslide verdict in 2013. He promised peace. At a breakfast meeting in Lahore, he told me that Pakistan would soon buy power from India. We saw how quickly that degenerated into bitter acrimony — terror attacks at Pathankot and Uri followed by cross-border retaliatory raids by the Indian Army. In the India-Pakistan relationship, one lives with disappointment and hope. In his victory speech, Khan said he would take ‘two steps’ for every positive Indian step. Prime Minister Narendra Modi congratulated him on his victory and hoped that democracy will emerge stronger in Pakistan. There’s hope of peace talks between the two but only a small window that will soon shut when PM Modi goes into election mode and Khan’s honeymoon period ends. Both leaders need to move fast. I’ve always maintained peace is the only way forward if India and Pakistan are to realise their development goals and lift their people out of poverty. We need to give peace a chance. Again. The writer is chairman and editor-in-chief of the India Today Group.